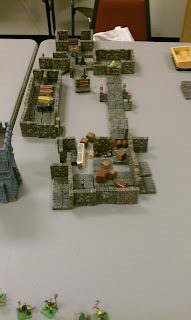 (I got to use my new DwarvenForge Kickstarter pieces, I literally grabbed them out of my duffle bag and plopped them down on the table, that's why it looks a little haphazard, but it took zero time to set up the dungeon as the players explored it). After an intense and heated exchange between our trio and the Night Watch, they were convinced (more like cajoled) to follow the slime trail into the undercity and bring back proof that something else killed the murdered man other than the party, the watchmen cared not one bit that our trio had just really met Ostra. The trail led them under the ruined temple, the Night Watch captain said it was an abandoned temple of Bezra Ka (he spit and sneered at the name), the captain went on to proudly proclaim that the church of Tsathoggua had driven the worshippers of Bezra Ka out of the city decades ago. Ostra using her ranger tracking ability was able to easily follow the slime trail through the sewers and wound up under the temple in what appeared to be its basement. After a bit of exploration and crawling through some giant rat tunnels (curious no rats! 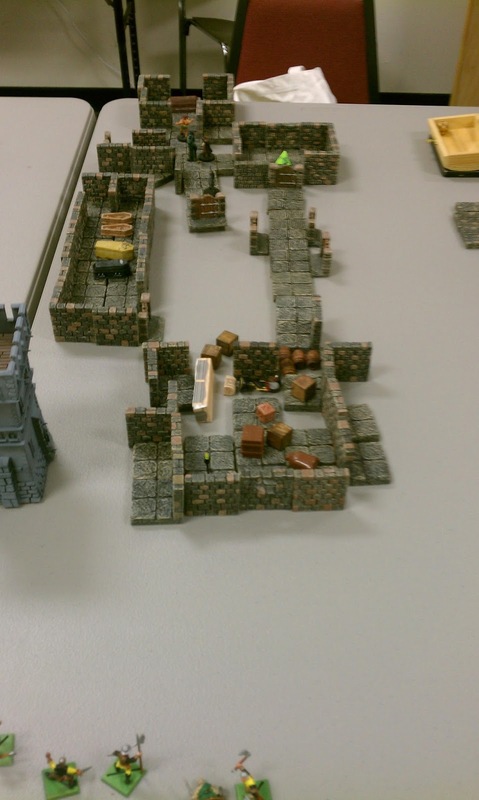 ), avoiding disturbing the temples crypts (Rizlich said he had a bad feeling about that room), wading through a moldy, soggy library, they found a corridor with a series of doors. Behind one they heard munching, but it didn't sound like giant rats…behind another they heard faint music, almost sounded like tavern music? !, but the slime trail continued onward down the hall. Following it, they found themselves in some sort of ceremonial meeting room with an altar in the middle of the room, and several tapestries on the wall. Rizlich spent some time trying to decipher the religious symbols and messages on the wall…something about a coffin or sarcophagus? ?, Houk gripped his axe, he was ready for a fight and tired of wandering these underhalls. Even though the slime trail seemed to be dissipating, Ostra was still able to find it. It led them to a secret panel in the wall behind one of the tapestries. Rizlich was still intensely studying the images and symbols on the walls and tapestries; he seemed to think there was some sort of healing ritual described therein. Ostra was on the hunt and not interested in old religions, and Houk was antsy to fight something. With the slime trail (and Ostra's tracking ability) they determined that there must be a secret door and indeed there was! Fast forward….after more exploration, debate and searching; a chamber with a sarcophagus like the one depicted on the tapestries was found. While Houk and Ostra tried to determine the best way to open it, Rizlich searched a bit more on his own further down the hallway! Finding a door he opened it! He saw before him a large room filled with smelly trash and debris, he could hear music faintly coming from above and what sounded a bit like laughter, just then some trash fell from a hole up above and landed in the already large pile. He'd found the trash dump for a tavern or inn up above. Deciding to explore the debris further he entered the room! Just then on the other end of the corridor the sarcophagus burst open and a muscular man leapt out to attack Ostra and Houk! He wasn't any ordinary man however, he was pale, gaunt, dead looking, and a tentacle-like swarm of lavender worms shot out of his mouth like some evil extra appendage, clearly intent on doing them harm! Rizlich was in no position to help them however, because just then a large green wormy-caterpillar-like creature with tentacles burst up from the trash and debris and attack Rizlich! Intense combat ensued, and it looked like Rizlich was not going to make it, down to one hit point he stood his ground in true Kimmerian fashion, actually wounding the beast a good bit. Meanwhile Houk was in full berserker rage battling out with the animated wormy corpse. Ostra did what she could against the worm-wraith, but Houk was in brutal melee with it, and actually seemed to have the upper hand. Realizing Rizlich was in the fight of his lift just across the hall, Ostra unleashed a torrent of attacks against the tentacle worm-thing battling Rizlich and between the two of them they finished it off, just as Rizlich was about to collapse. They both turned to see the worm-wraith battling Houk desperately trying to escape the wrath of the berserker, he battled the thing all the way back into the sarcophagus and was tearing it to shreds, Ostra started to run to help, but Rizlich panting from exhaustion and his wounds, held the ranger back warning, "don't get too close to him when he is like that, he can't tell friend from foe!". Eyes wide the ranger held back until Houk finally stopped cutting the long dead beast and slumped against the wall exhausted. After a rest, Rizlich decided the sarcophagus was some sort of healing device and the worm-thing was using it to try to stay alive. They found a bit of treasure in the trash room. Rizlich tried unsuccessfully to heal up in the sarcophagus, but determined a longer rest period in it would work. 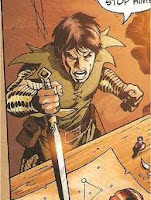 Ostra took the sword that the worm-wraith was using; Houk said he preferred his axe. Venturing further into the catacombs beneath the Temple of Bezra-Ka they encountered a campsite, complete with a snoring guard. Startling the guard, they figured out it was a camp of robbers that had made some sort of arrangement with the foul thing they had recently slain. The heroes dispatched the guard and his brethren when they arrived. Then promptly looted the robber's treasure. Oh and to make this post a bit more cooler, I just found where Starter Traveller RPG is on sale for FREE! Check it out here! It's a Christmas Special running through December 31st! All the recent STARSLUGS posts on various blogs have got me looking at Traveller again. Welcome to Khromarium We hope you survive the Experience! 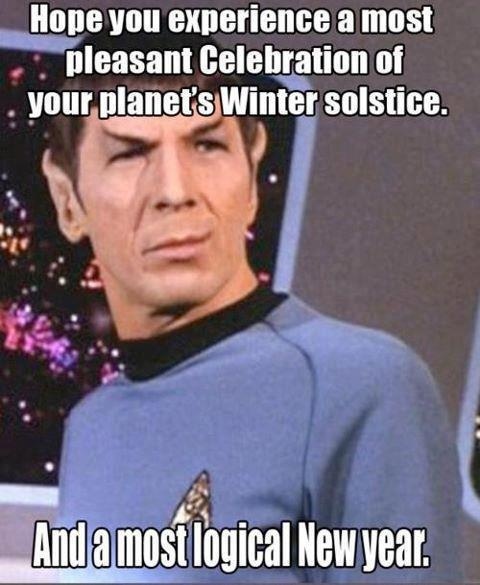 I hope everyone is having a great Thanksgiving! I'm finally getting some much needed downtime. We played Astonishing Swordsmen & Sorcerers of Hyperborea last Sunday, I can't say enough good things about this game. 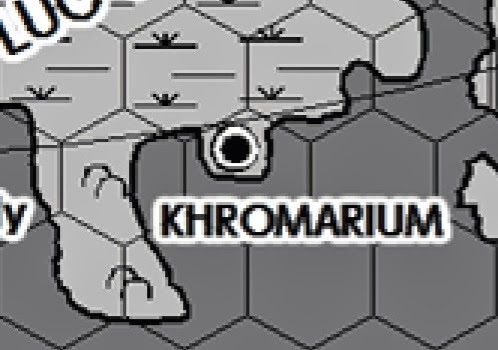 Session 2a : Welcome to Khromarium; We hope you survive the Experience! Houk and Rizlich, soon realized that finding their way around the ancient, massive city of Khromarium was a challenge in and of itself, both were awed by the city's massive towers, eerie and dark, their shapes unworldly and unnatural. A grayish snow was falling and covered most everything; they could see massive smokestacks off in the distance and assumed it was ashes from those smokestacks that were tainting the snow grey; at least that's what they hoped it was. Occasionally they would see figures in the distance moving about with a purpose, most were heavily cloaked and hooded, not unusual in the bitter cold of the dark night. Houk vainly tried to hail a few of them, he had wanted to make it to the Serpentine Nymph tonight but at this point, having wandered for what seemed like hours, not to mention cold and hungry he'd take any place with a fire that was out of the wind. Unfortunately anyone that they saw... and those were few and far between would quickly avoid the pair and dart away into the darkness of the night. Ostra, had made the long journey to Khromarium, having just recently arrived at the docks, the city was beyond anything she could have imagined. Noting the unnaturalness of the dark towers, she shuddered and it wasn't just from the cold. The last words of her oracle were that the source of the evil that had devastated her people was to be found in Khromarium, but she could never have imagined a place so vast. This was far from the wilderness that she knew so well. Shouldering her gear she set out into the darkness, with some of the crew from the ship. Houk and Rizlich, caught a glimmer of hope, lights could be seen in the distance, as well as, noises of what sounded like people up ahead between the old buildings and structures. They paused however when they heard a scream piercing the night, a scream that was cut short. They moved forward with grim determination. Ostra, never did trust these crew-men from the ship, they acted more like pirates than true sailors. She never cared for the glares they gave her on the ship, but now that they were off of the vessel, away from its Captain and walking down these eerie darkened streets she knew she wasn't safe. When she overheard two of them murmuring their plans for her, she knew she had to make her move. When they turned to the left down a dark snow swept street, she veered to the right and hid in the shadows until they were gone. She made her way in the darkness, while happy she had ditched the unsavory crew, she now found herself lost in the largest city in all of Hyperborea. Then she heard a scream cut through the cold dark night. Houk, Rizlich and Ostra found themselves face to face after rounding one of Khromarium's twisting streets. After a short exchange they realized they were all new to the city, they started to walk together for a bit, figuring their would be safety in numbers, all three looking for a warm fire and some hot food. Rounding another turn Houk stumpled in a pile of trash…pausing he realized that it wasn't trash but was in fact a corpse and the body was still warm. Upon examining it, Rizlich the shaman noted the body had what appeared to be acid burns, and to add to the horror, several chest wounds on the dead man had lavender wriggling worms coming out of them! Ostra grimaced at this, some horror from the Black Gulf was no doubt behind this murder. The ranger spotted a trail of slime leading off in the direction of some ruined temple structure. Just then an order of "Halt where you are butchers!" rang out, the trio looked up to see they were surrounded by a patrol of the Night Watch and they looked none too pleased! It's a Great Time to Pick up AS&SH! 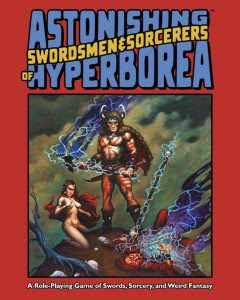 We played Astonishing Swordsmen and Sorcerers of Hyperborea again Sunday, I have to once again say what a great game this is! I'll try to post something of a session log soon. 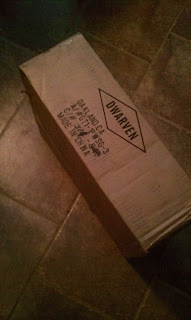 Dwarven Forge Kickstarter has Arrived!! 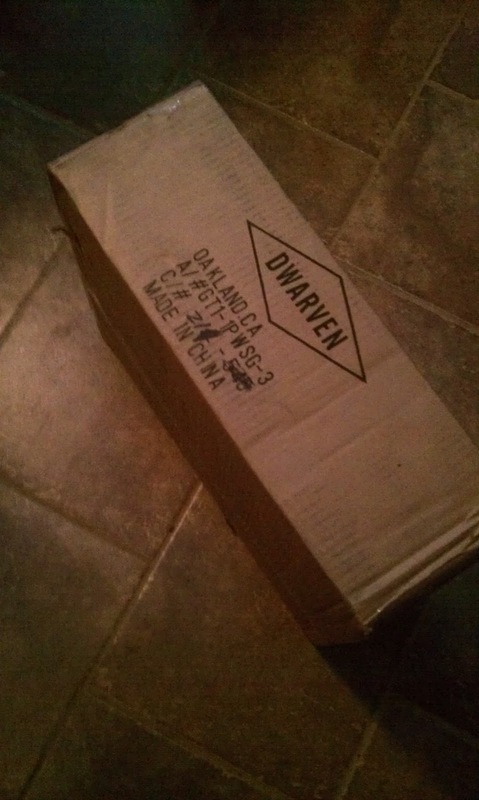 Look what was on my front porch this afternoon!!! Unfortunately I have an event to attend this evening, so the official unboxing will have to wait! I will say this thing is Heavy! I can't wait to dig into this one! 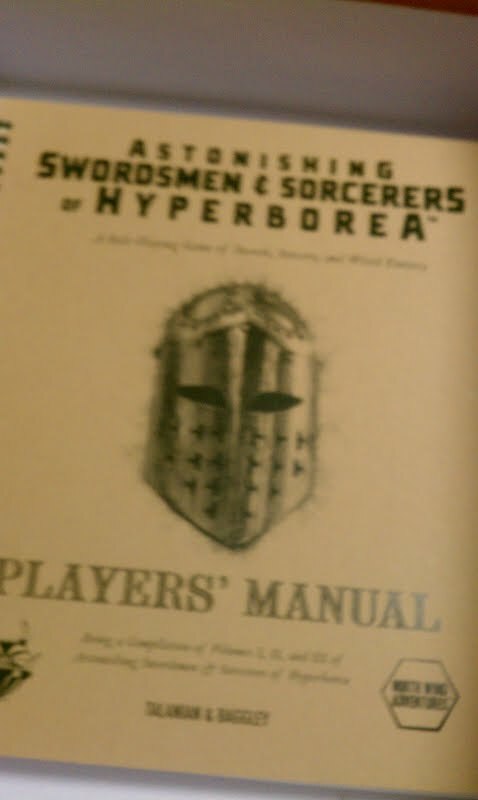 A friend of mine was going to run a Session of Castles & Crusades today, I asked him would he mind if I brought my Astonishing Swordsmen and Sorcerers of Hyperborea boxed set to show the gang during breaks. He said sure, that he wanted to take a look at the game also. While we were chatting before we got started, they asked me about the game and I started going into the Hyperborean Campaign Setting, both were very interested in it. 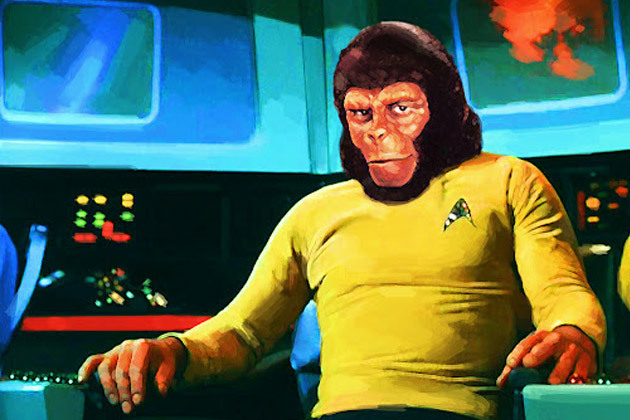 My friend that was going to run C&C said could we please please make up characters for AS&SH, the other player nodded in agreement (one player couldn't make it). I said well ok if you want too. I didn't want to upstage the C&C game, but both of them were really interested in AS &SH. So we got to it, they both sat down and rolled up characters. They were oohing and aahing over all the various sub-classes. Even though I wasn't overly familiar with the rules (I just got the box in the mail a couple of days ago, however I've played AD&D for decades), the layout was so well done, that what questions we did have we could easily find the answers too. The biggest issue one player had was trying to narrow down which class to be, "they are all so cool" he told me. But before long, Houk the Viking Berserker and Rizlich the Kimmerian Shaman were born. Then they said, "Can you run us through something!" I was saying, "Um..., well I hadn't planned on running, I'm still reading the rules, and I don't want to take away from the C&C game.." but with their eager faces who was I to say no, so I quickly rolled up some rag tag bandits. Told them it was winter and they had just crossed the frozen peat bogs of the Lug Wasteland, they could see the black spires of the city of Khromarium in the distance, the red sun was setting and Saturn with its rings could be seen in the sky as dusk was fast approaching. The duo had teamed up because there is safety in numbers, although the shaman was a bit cautious around his hot tempered companion, one can't be two careful nowadays. The bandits tried to ambush the two, and demanded they pay a toll to use the "road", Houk was having none of this and went into a berserk rage, charging and attacking. 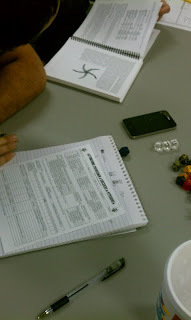 The Berserker rolled a critical on the very first combat roll of the game! My friend's eyes lit up with glee and he said,"That's a great sign! This is the game we need to be playing! ", he badly mauled the bandit leader with his first hit, as Rizlich not to be outdone scored some serious damage on another bandit with his short bow, the other bandits were soon overwhelmed, and before long only Houk and Rizlich remained. Rizlich keeping a safe distance as the berserker hacked, kicked and spit at the dead remains of the fallen bandits. Houk eventually calmed down and looted the dead bandits. In addition to the bandits weapons & gear (none of which seemed to be remarkable), they found some electrum pieces a pittance of silver coin, a bit of polished amber and a map! Rizlich studied the map in the fading light, he could tell it marked what looked like an area of tombs a days journey from the city. Definately something to look into...on another day. They needed warmth, ale and wenches! Finally reaching the gates of the city, Houk bribed the guard, and added an extra bit of gold to learn what was the the best place for Good Mead and Great Wenches! The guard smiled and replied,"Why the Serpentine Nymph of course!" The two grinned at one another and headed off to find the Serpentine Nymph. 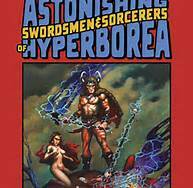 I continue to dig into the box of awesomeness that is Astonishing Swordsmen and Sorcerers of Hyperborea. One way I like to try out a system is to see if I can convert characters, monsters and such from my library of comics and books. 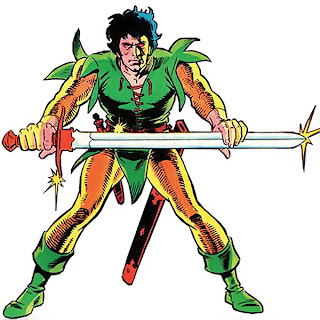 So today I tried my hand at working up an old DC comics Sword & Sorcery Anti-Hero. He sees no need to hoard gold or coin he readily spends what he gains if it furthers his cause. As a youth, the man once known as Elpis, was thrown out of his home and grew up on the harsh and unforgiving streets of Khromarium, after surviving a tortured life on the streets he grew up to become a desperate and hopeless young man. Stumbling upon a temple to Thaumagorga, he offered a desperate prayer; Thaumagorga not only heard the prayer but responded. Thaumagorga struck a bargain with Elpis; in exchange for the young man's soul the dark god bestowed great power upon the man both martial and magical. 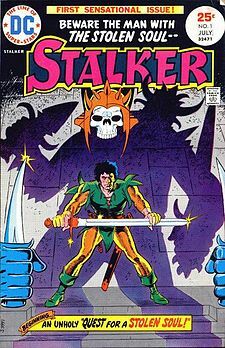 Now calling himself Stalker the Soulless he went out to seek his fortune. However, he soon realized he could not truly live without his soul and has been on a desperate quest ever since to get it back and to thwart Thaumagorga at every turn. He believes the only way to recover it, is to destroy every worshipper of Thaumagorga, a daunting and no doubt impossible task, but Stalker presses on. No one should take this to mean that Stalker is merciful, kind or even remotely good. He is self-serving, and having no soul he feels no remorse for any of his actions. To him the end justifies the means, and for him his very soul is at stake. While he sees no point in random murder and torture, if torturing someone will help him with his quest he has no qualms about doing so and if your a worshipper of Thaumagorga, may the gods have mercy on your soul, because Stalker most certainly won't! Stalker is based on the DC Comics character that first appeared in 1975, no copyright infringement is intended. 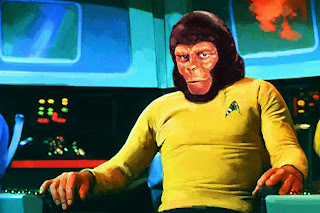 I have modified his background somewhat to fit into the AS&SH setting.